What do violets, chickweed, dandelions, onion grass and May apples all have in common? They are all edible plants. And that fact is just the barest scratching on the surface of the things we learned when we went mushroom hunting last weekend with Alan Muskat of No Taste Like Home. At our bed and breakfast in Asheville, the Carolina Bed & Breakfast, we grow a lot of herbs and vegetables which we use in our cooking. However, living in Western North Carolina on the edge of the Blue Ridge Mountains, we have also learned to appreciate the forests and glades surrounding us and the rich wildlife, both plant and animal, which makes its home here. Sara, our assistant innkeeper, always seems to know when the wild mushrooms are ready for picking, and James and I envy her the morels she finds every Spring. If only we had the knowledge (and free time) to find some for ourselves. This past December, I was flipping through Southern Living when I came across “10 Christmas Gift Trips,” a list of some unique and unusual excursions. 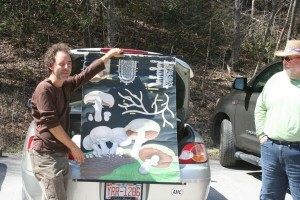 And there at number 4 was a mushroom foraging trip being held in Asheville! James is known in my family as being extremely difficult to buy presents for, so I immediately booked us in for an April trip. 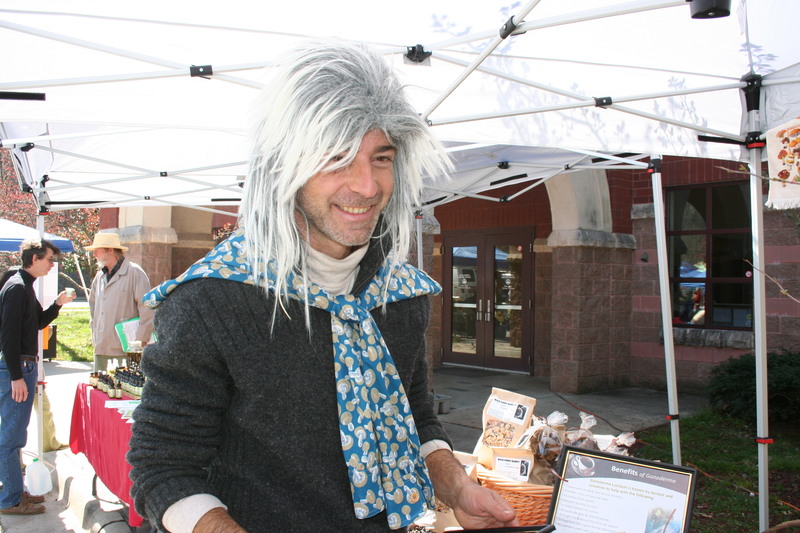 Alan Muskat calls himself “The Mushroom Man,” and he is a real character in true Asheville fashion. James and I stopped off at his table at the Asheville City Market this past Saturday just to say hello before meeting up with him later that afternoon. 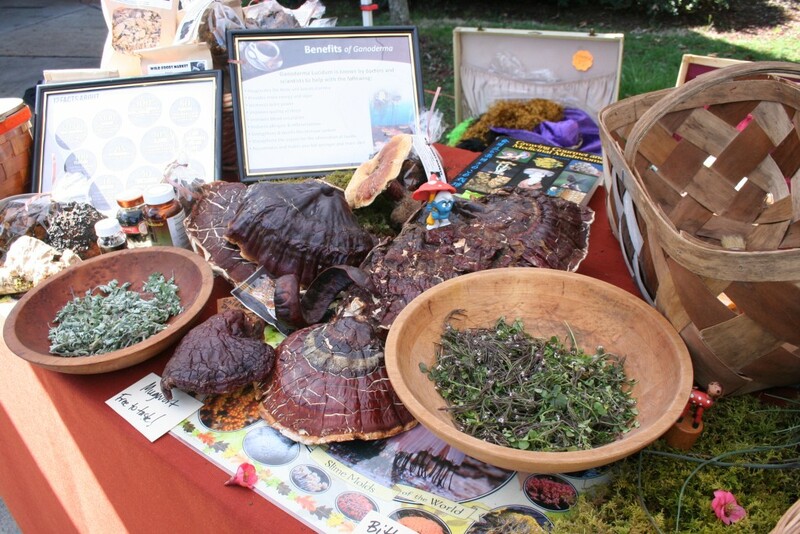 The display table looked like a fairyland of mushrooms, roots and plants with toy frogs rising up out of baskets of greens, Papa Smurf seated on a large mushroom and Alan and his friends wearing multicolored wigs. Clearly this was going to be an interesting afternoon. Once at Old Fort, we spent some time getting to know each other and Alan gave us a brief introduction to the art of foraging and how to do it safely. In a nutshell (sorry) it comes down to this: guidebooks are not very helpful as looking at a single picture of a mushroom and expecting all mushrooms of that type to look like the picture would be like looking at a picture of a single person and expecting every other person to look like that picture. With time, you will get to know the difference between mushrooms in the same way you know the difference between a head of cabbage and a head of iceberg lettuce. Until then, ASK. If there is anything that Alan impressed upon us it that the very best way to make sure that what you have harvested will agree with you is to ask someone who knows. And if in doubt about the extent of your friend’s knowledge, ask a few more people. In actual fact, out of the more than 2000 species of mushrooms found in our area only four or five are deadly. Some may be “regrettable” and others may be “forgettable” but most won’t kill you. Nevertheless, as Alan put it, you don’t want to be playing “mushroom roulette,” so ASK! We could find about three. 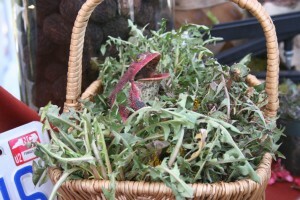 Alan was amazing, ripping off leaves and popping them in his mouth, he was so comfortable with the concept of foraging. We found a pretty white flower and he bent down to scrape away to the root. 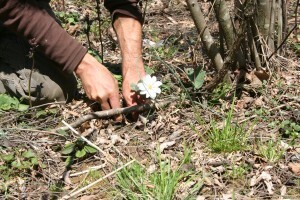 The flower was Bloodroot and it is called that because the root bleeds red when scraped. Soon woke the Dormouse: “Good gracious me! Where is my toadstool?” loud he lamented. And that’s how umbrellas first were invented. This was pretty much how the afternoon went. When he wasn’t showing us plants and feeding them to us, he was telling us stories about them and reciting poetry. We wandered deeper into the forest, not finding any mushrooms but finding plenty of other things to bring to Alan. No matter what we showed him, Alan was seldom stumped, and when he was, he had a friend along who also lived in the mountains and what Alan didn’t know, Thomas did. Thomas Marlow, who “shares a cabin in the National Forest just outside Old Fort with two plott hounds and an old woodstove,” comes along on the trips as a photographer. The photographs are later sent to the participants so that you don’t have to worry about taking pictures and can focus on foraging. He also knows an awful lot about the forest and glens. As we were walking through the woods my eye was caught by a strange-looking fungus growing on the side of a tree. If not for that fact that we were out looking for mushrooms, I might have walked by but I broke off the piece of bark with the growth on it and took it over to Alan. I thought he was kidding when Alan called everyone over and said that, unless he was wrong (Alan is the king of qualifiers) this was a Cordyceps. 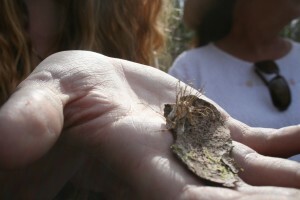 He called the Cordydeps a “zombie fungi” and said he had only seen one other in his twenty years of foraging. You can learn about the Cordyceps in this video from Planet Earth. See if you can identify my Cordyceps. This one has taken over the body and brain of a moth. Everyone agreed that this was a pretty cool way to end up the day, so we headed back to the carpark. Some of our group had booked tables at Zambra here in Asheville for dinner. If we had found anything worth harvesting, they could take them to the restaurant and Chef Adam Bannasch would use them to make a special dish for their meal. Even though we weren’t bringing anything back with us, my suspicion is that Adam made something for them with a forest harvest anyway. Back at the carpark, Alan had one final performance for us. 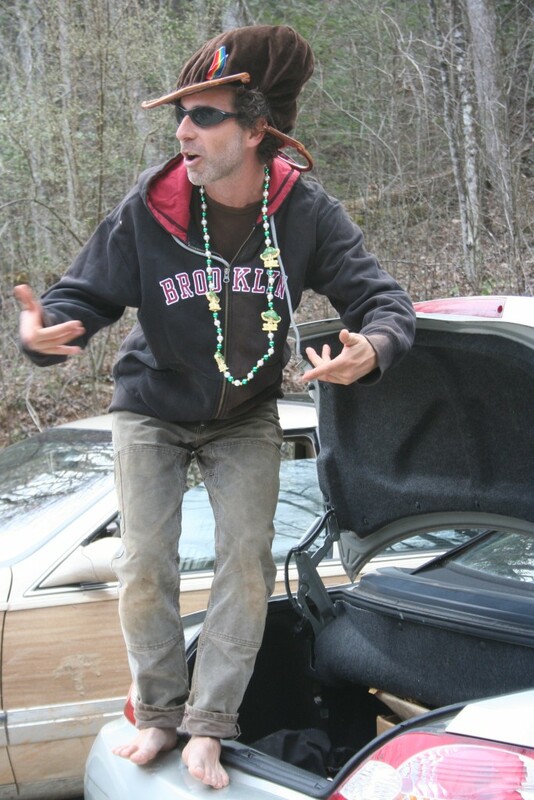 Opening his trunk he pulled a hoodie, some bead and sunglasses. Turning an old velvet bag into a hat, he launched into a “Mushroom Rap.” It was a perfectly fitting end to a day which was never what we expected and always an adventure.